Looking to bring in some fun and excitement to your party. 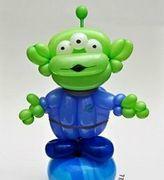 Hire one of our balloon artists to create the latest and greatest in balloon twisting fun! Our balloon artist cast members are great for birthday parties, corporate events, church events, and town festivals. Our balloon cast members book up very fast so please make sure your book you party in advance.